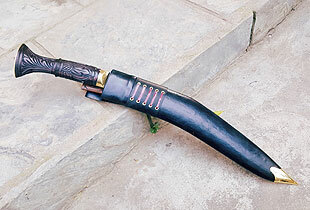 Latest New Sirupate 15" Long Khukuri by this House with Fine Wood Artistry done on the handle (that Nepal is famous for), beautifully hand carved handle. This is like Icing on the cake, the blade that is already a Superior knife is made even more Fantastic with the addition of Hand Carved wood handle. Good to the eye and Good in the grip too.